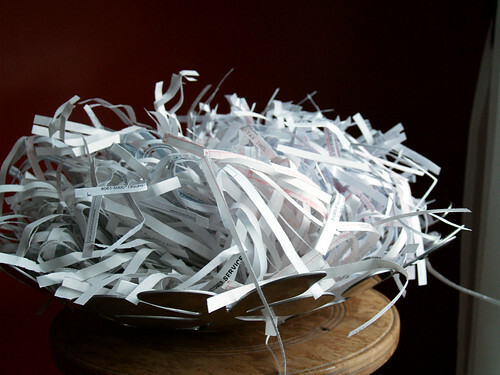 Lately I’ve been researching whether shredded office paper is appropriate for the compost pile. The results seem to be inconclusive, though leaning heavily toward it being OK.
I’ve added my old shredded phone bills and medical statements to the compost before (watch the wind whip shreds of your life across the backyard! ), but I’m questioning whether I want to make it a regular practice. Some people think it’s OK if you’ve got a shortage of brown matter. Others say that the waxes and metals in the inks make it a bad idea. My thinking is that it’s biodegradable, it’s uncoated, and one less thing that has to be collected by our recycling service. Plus, I’ve always heard that newspaper makes a great soil amendment. Here’s an interesting list of household items that are OK to be composted. I never considered adding hair, but I’ve always tossed in tea bags and coffee grounds with filters. What do you think? Do you have any creative additions to your compost?